Vuelta a España's Stage 6 was a sprinters course and covered 175km of inland terrain from Guijuelo to Caceres. The majority of the race was led by Tony Martin who was not caught until after the 500 meter mark. 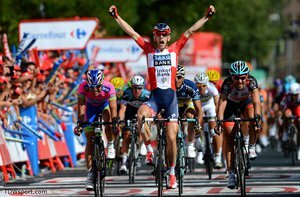 Saxo Bank Tinkoff's Michael Morkov was victorious in the final sprint followed by Maximiliano Richeze (Lampre) and Fabian Cancellara (RadioShack-Leopard). Vuelta a España's Stage 3 followed a relatively flat 184.8km route along the Spanish sea coast and featured a summit finish in Mirador de Lobeira. 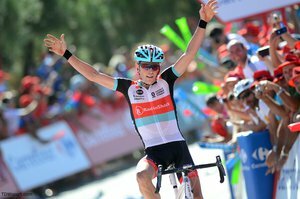 RadioShack Leopard's accomplished veteran rider, Chris Horner, made a successful solo attack on the final climb, a 2km ascent with an average grade of 10%. Horner's momentous move came in the last kilometer and the SRM race file below illustrates his efforts throughout the stage and highlights his climbing strength as he battled for the win. Peter Sagan, Cannondale Pro Cycling's power-house sprinter, won the final two stages of the USA Pro Challenge. He took four stage victories throughout the race and finished with the Green Jersey. Sagan, racing at approximately 75kg, has shared his SRM data from the final stages emphasizing the demands of racing in the Colorado Rocky Mountains and the powerful sprint efforts needed for victory. 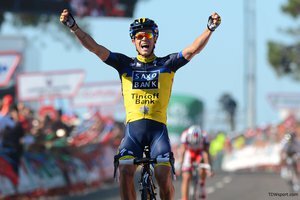 Team Saxo Bank Tinkoff's Nicolas Roche rode to a career highlight win in Stage 2 of Vuelta A España. The early mountain stage began in Pontevedra and snaked 176.8km to an uphill finish in Alto Do Monte Da Groba. Nico, two time Irish National Champion, out rode Katusha's Daniel Moreno Fernandez for the stage win in 4:37:09. The USA Pro Challenge Stage 1 was a 97.6km circuit race in Aspen, Colorado. The seven day event, known as America's Race, began at an elevation of nearly 2,400 meters (8,000 feet), posing a substantial challenge to riders. The route featured three 32.5km laps and despite late attacks from George Bennett (RadioShack Leopard) and Carter Jones (Bissell) it was the Slovakian sprinter, Peter Sagan, who took the win for Cannondale Pro Cycling. Sagan's SRM file below illustrates the demands of racing in the Colorado Rocky Mountains and the powerful sprint effort needed for victory.